I have done some investigating regarding important dates and searching records. I am maximizing the two week trial on ancestory.ca. I still have questions and mysteries I want to solve but I thought I would begin by sharing what I have so far and I realize this only tells part of the story. My plan is to do a blog on each person with more details. I have been able to trace back to some of my great great great grandparents. Freeman and Ellen had three boys: Henry (1864), Dan (1877) and Louis (1877). On June 28 1905 Louis married Annie Sullivan. Louis A Conn and Annie Sullivan marriage. Annie Sullivan was born in England in 1881 to John Sullivan and Mary Darcy. In 1899 Annie immigrated to USA. Annie’s record of immigration She was 18 and working as a servant (I’m thinking Downton Abbey but probably not). The family then moved (When? Why?) to Lake Placid New York. John F Conn was born in Lake Placid December 15 1908. John enlisted and fought in WWII. John married Mary and had two children. I am extremely grateful that I have connected with his daughter, she is awesome! Mary Conn married Frank de Jourdan. They had four boys and seven grandchildren. There are currently six great grandchildren that did not have the opportunity to meet these wonderful people. 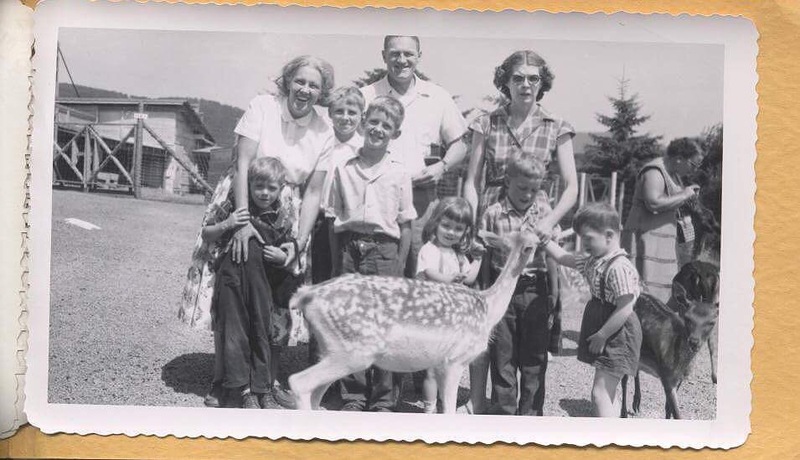 This picture is Mary A Conn and her family visiting her brother John and his family in North Pole, New York. In the picture is: Mary de Jourdan and her four sons: John, Paul, David and Leo with John F Conn, his wife Mary and their children Mary and Mike. Deaths of Louis Conn and Annie Sullivan, I know that Annie was a widow. The mystery about Bermuda – Annie and her adult children travelled to Bermuda a couple of times, I am thinking that Mary and John were working at a resort there. When I went back to LP for Mike’s burial I took pics of all of the gravestones but am unable to find them. Will ask my BFF to see if she can stop by the cemetery and do so. It will at least have the DOD’s for you. Also there is a Sullivan there. For some reason I think he was Edward, but not positive. It seems a lot of answers are in NH. I tried to get in touch with one via FB but never got to actually talk to her. Seems like someone older might be able to shed some light? Well done Emily! You have been busy..thank you so much.